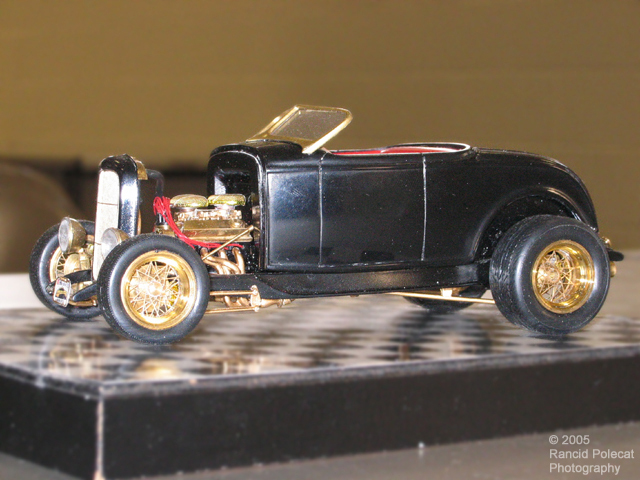 You might think Chad started with Revell's Roadster kit, but he built this model long before that kit hit the market. Starting with the Revell 1932 Ford Coupe kit, Chad swapped in the frame, body, and Duvall windshield parts from the Replicas and Minatures Company of Maryland. He also fitted a Model Car Garage photoetched grille insert to an R&M Co. Grille shell. For rolling stock, Chad wrapped a set of Aluma-Coupe type tires around a set of his own home-machined rims with detail master photoetched spokes. He also turned all four disc brakes himself.